One week exactly till I have to speak Basque on TV (well, take part in the recording). Last night, Uñai cancelled this morning’s lesson. The day kicked-off with a 40 minute walk round the park, listening to Basque talk radio. Decided to work with the Arian B2.1 textbook again for a change. So, thirty minutes this morning listening and reading about the experiences of four Basque students, their reasons for learning and methods. Took dictations of the short conversations from the audio recording and then checked them. Then I went out to shoot more pieces to camera in my “Dr Popkins Method?” video series. I’ve run out of “locations” in the house, so I decided to split each of the next three vids into three and shot a third of each in a different café. I had my morning espresso in one of my local cafés and short the first section of each three. Then out to another café to film the middle third of the next three “Dr Popkins” videos. A problem with vlogging from cafés – erm, a problem with cafés in general – is that they often have music blaring out. I was reduced to sitting outside Café Stir where then enemy then became the traffic noise on Brixton Hill, especially the frequent sirens. Ambulances are worse offenders than police cars. They all sound like wannabe extras from a US cop series circa 1975. Bring back 1950s Ealing comedy police car bells. Then I went down the hill to the centre of Brixton to shee to shoot the final third. I did this in the Brixton Blend Café which is just opposite the David Bowie mosaic and hung out there a bit longer to do some more editing of tomorrow’s Eisteddfod vlog, part two. This evening, a further thirty minutes from Arian, instead of preparing for the session with Iñigo tomorrow. It’s refreshing to be working with a different book. The Habe lesson sheets are rather quirky (and at a lower level). Bakaraka is very thorough and great for practising structures, but rather dry and distant from real life (the texts are rarely conversations or on contemporary subjects, for example). Kicked off with an early run in the park: 25 mins passive Basque radio exposure. 45 minute lesson with Iñigo. We continued to work with “Habe” unit 34. Some more practice of reported speech. Then a reading exercise, with questions, about two bizarre couples. Finally, some extracts from newspaper dating small ads. Half an hour this evening preparing vocab to do with cooking. I’m going to be doing some for the show. I’d already covered most of the vocab but can’t recall it actively. I wasn’t sure whether the lesson with Uñai was still on, given that he cancelled due to illness on Monday. Although I showed up at 8.30 this morning, he didn’t. That threw me rather. I should have mailed to ask him last night but for some reason hadn’t. Actually, for two reasons: (1) I thought I shouldn’t fuss; (2) I kinda think the person who’s deviated from the plan should take the lead in checking what happens next. Went for a 25 min run in the park instead, with Basque radio playing in the earphones. Late afternoon I was back in the centre of Brixton. I found two cafés more in to film the intros and “outros” for “Dr Popkins” videos five and six. One is quite a cool place off Coldharbour Lane, spoiled only by more loud music (it touts itself as a shared workspace, with desks for hire at the back. Not sure intrusive music goes with that). Tonight I did two half-hour sessions doing more prep for the television shoot. Tried to make up phrases related to cooking. I think they’ll probably ask me about how I learn languages as well, so I’ve been working on vocab around that too. Uñai mailed tonight to confirm that he’s back in action tomorrow. I have a lesson with him and another with Iñigo tomorrow. During both, my plan is to check the phrases and practise them. Iñigo failed to show for our 2pm lesson. A mix-up over what we’d agreed. Uñai is now back in action and at 18:00 I had a session with him. Quick general chat and then we worked on the vocab and phrases I prepared yesterday around making Welsh cakes, my approach to language learning and my life in London. No more Basque today, apart from some passive radio exposure. Tonight I made Welsh cakes for the first time. They were a bit burned because I hadn’t rolled the mixture thickly enough. Morning run with Basque on the radio. Discussion included the removal of Franco’s body from the Valley of the Fallen. Then train up to my father’s in Yorkshire for the weekend. 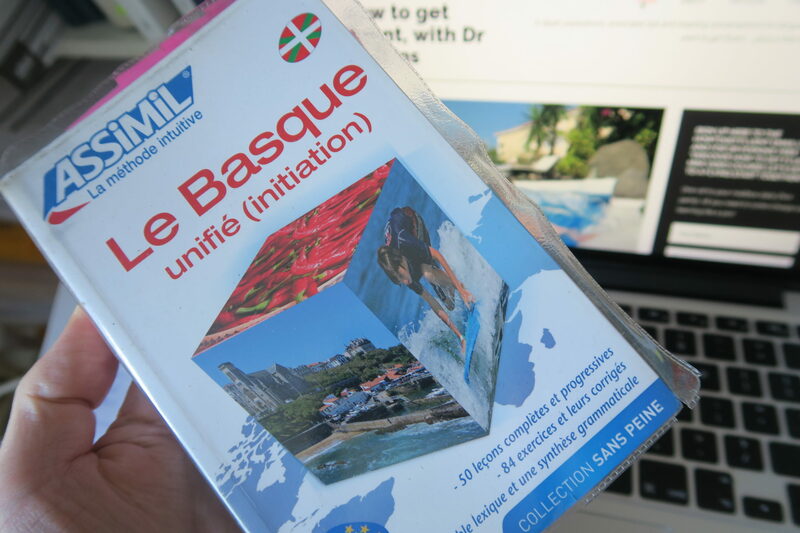 During the journey I spent about 40 minutes reviewing several chapters in Assimil Basque. At my dad’s I also went over the vocab and phrases I’d worked up with Uñai yesterday, but that was it on Basque today. Dad also gave me a lesson in making Welsh cakes as a result of which I discovered a couple of tricks (beat the egg before you add it to the mixture; coat the rolling-pin with flour so that the mixture doesn’t stick to it). Relaxing at my dad’s in Malton. Did about thirty minutes working on Assimil in Costa Coffee, my regular coffee shop there. I don’t normally like hanging in chains and the espresso at Costa Malton is not very good. The problem is, most of the other coffee shops there are a bit too flowery china and doily for me. There is a new hipster roastery but it’s too cool to have proper tables and closed more than it’s open. Lesson with Eider, ten minutes general chat. I explained the journey up to my father’s and what I’ve been doing here. Then we went on to practise the conversation topics for tomorrow’s TV recording. Eider had heard of the “Vendetta” group that the presenter of “my” programme, Pello Reparez, sings in and she seemed quite excited by the prospect. Train back south in mid afternoon. Read Basque novel on train for about 20 minutes but spent a lot of the time editing video (both easier and more fun….). Tonight: the final pre-shoot lesson with Iñigo. He was telling me that he had been pickpocketed in Donostia, but got his cards back. Then I once again practised my conversation topics in advance of the shoot. Not really feeling nervous but not really sure what to expect tomorrow either. It’s a good opportunity, though. Week One: three Basque lessons (plus one aborted after ten minutes due to computer failure) and seven hours’ study over six days. Week Two: five Basque lessons and two hours’ study over two days. Week Three: eight Basque lessons and two-and-a-half hours’ study over six days. Week Four (includes the final Sunday, technically the “fifth week”): four Basque lessons and three hours 10 minutes of study. My original target for the project was to have a thirty or forty-five minute Basque lesson five days a week and do at least thirty minutes self-study five times a week. Over the four weeks, that would have meant twenty lessons and ten hours of self-study. My actual total was twenty lessons and a little over fourteen hours of self-study. In addition to that, I had several “real” Skype calls with the programme makers and passive exposure to Basque radio. I was listening daily, either when running or while at home doing chores/eating. So, I made the target for lessons and overshot nicely with the self-study. The lessons were not distributed as evenly as I’d have liked due to teacher availability and cancellations. It was looking particularly bleak on the Thursday of week one, when I’d only clocked one thirty minute lesson (plus the abortive ten-minutes on Wednesday). Here it really helped that I have three teachers. As I pointed out in a recent “Quick Tip Tuesday” vlog, it’s a good to make sure you don’t rely on just one teacher or conversation partner. The weakest week was the second. That was entirely due to my decision to travel to Wales to attend the National Eisteddfod. That was a great trip but it did resulted in my cancelling a Thursday and Friday lesson and not doing anything Thursday to Saturday. As usual, I found that having made a public commitment to a certain amount of study really helped to keep me focussed. Without this accountability, my Basque would still have been motoring along but at a lower pace. How about my substantive achievement? I’m not sure I feel any shift in my speaking over the month, which, with these relatively low practice figures is no surprise. As regular readers will know, I normally prefer three-month projects, because there’s more time for a shift to register. If anything, it’s my radio listening comprehension that seems to be moving most in Basque at the moment. There’s no doubt, though, that I was a lot better prepared for the television experience than I would have been without this little project. Again: having such goal a month ahead really gave me something to work towards. What of Monday’s shoot itself? I was nervous but it all went well. I was spluttering and making mistakes but also really speaking. We stayed in Basque all the time as we filmed (which took from three fifteen in the afternoon to nine thirty in the evening). The programme is called Euskalonski. The presenter, Pello Reparaz, is travelling to major capitals with his guitar, seeking out Basque speakers and learners. The first episode is on Monday (from Paris). I’m not sure yet when “London” airs. I’ll let you know via twitter, the Howtogetfluent Facebook page and group. I’m on Instagram as well now (and loving “Instagram stories”. You won’t be surprised to hear that I was also shooting for a vlog of my own. I’ve decided to hold back with the completing and publishing that until the programme itself has aired. That way I can add a coda of me watching the programme and form a view of the finished product. Look out for a post all about the day itself with the vlog.